My sister is a brunch fiend. So, when she showed up early one Sunday morning and offered to make me brunch, I could hardly say no. She duly trotted off to the shops, returning with eggs, smoked salmon, chives and some delicious bread then set to work. I was relegated to smoked salmon chopping duties. The result was wonderful: creamy, soft eggs dotted with little pieces of chive and stirred through with smoked salmon. A feast for a king or queen, though it's probably a good thing she doesn't show up every Sunday morning! Slice the smoked salmon into 1cm ribbons, then crack the eggs into a mixing bowl and beat in the milk, chives, salt and pepper. Toast and butter the bread, then set on plates awaiting the egg. Melt the remaining butter over a low heat until liquid, then pour in the egg mixture. Stir constantly but gently with a wooden spoon for 3-5 minutes, until the egg is cooked but still slightly wet. 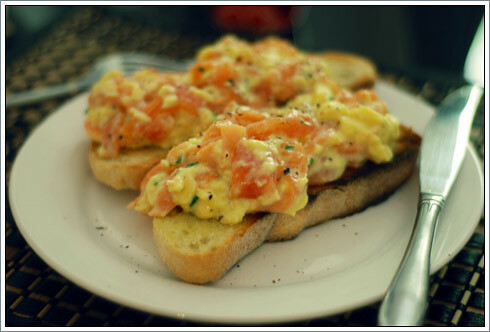 Finally, stir in the smoked salmon ribbons and divide the scrambled eggs between the two plates and get stuck in. i shall endeavour to check out Toast next time i'm in edinburgh - anywhere that does a mean smoked salmon & eggs is worth visiting in my book! think cooking is definitely something that runs in the family! it's nice to have someone to turn to for inspiration when my own runs dry too.